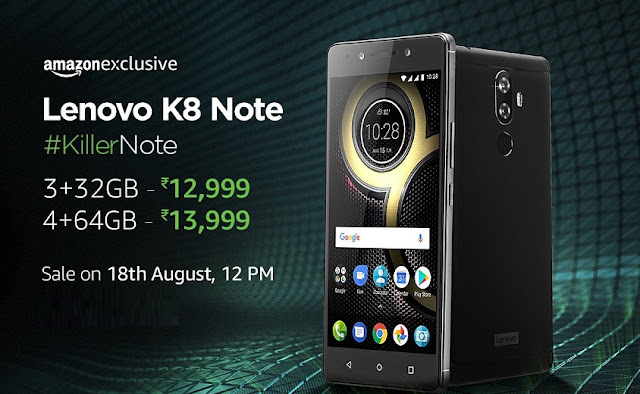 Lenovo has launched a new K-Series mid-range smartphone, the K8 Note in the Indian market with decent specifications. As it was teased with the choice of the ‘8’ symbol in the name, it comes with dual camera setup. It is also the first smartphone from Lenovo to come with this feature. Addition to the dual camera setup, the Lenovo K8 Note also holds a front LED flash, which is a plus point for the selfie lovers. The company has got an overwhelming response from its K-Series in India. According to the company, there have been 8.5 million K-Series users in the country. Another highlight besides the dual camera and a front LED flash is that instead of Vibe Pure UI, Lenovo has used stock Android in the handset enabling it to receive updates faster and improving the performance. The Android 7.1.1 Nougat running Lenovo K8 Note is a dual-SIM (Nano) smartphone built out of metal (5000-series aluminum) and polycarbonate. It features a 5.5-inch full-HD (1080×1920 pixels) display protected with 2.5D Corning Gorilla Glass. The handset is driven by a deca-core MediaTek MT6797 processor clocked at 2.3Ghz, and there are two storage variants; 4GB of RAM with 64GB of storage, and 3GB of RAM with 32GB storage. Both versions support for a microSD slot as well. Talking about the camera, as mentioned above the K8 Note comes with dual rear camera setup and a dual-LED CCT flash module, a 13-megapixel main sensor that’s accompanied a 5-megapixel depth sensor. The front houses a 13-megapixel shooter with an LED flash module. There is a 4000mAh non-removable battery that supports turbo charging with a 15W rapid charger that comes in the box. The body of K8 Note is splash-resistant with water-repellent nano-coating. On the connectivity front, it comes with 4G VoLTE, Wi-Fi 802.11ac, Bluetooth v4.1, GPS/ A-GPS, Micro-USB, and 3.5mm audio jack. It also holds a fingerprint scanner at the back. In India, The Lenovo K8 Note will be exclusively available via e-commerce platform Amazon India from 12pm IST, August 18. The 3GB RAM/ 32GB storage variant is priced at Rs. 12,999, while the 4GB RAM/ 64GB storage variant is priced at Rs. 13,999. The handset will be available in two colors options: Fine Gold and Venom Black.